Is this the ultimate iPod dock? | What Hi-Fi? 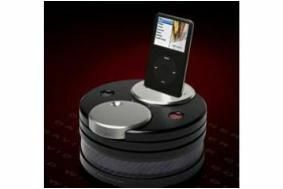 Is this the ultimate iPod dock? It's now available in the UK exclusively from London custom installation specialists The Pleasure Home, and it's yours for £1599. The Art.Suono is made from a solid piece of aluminium wrapped in carbon fibre, with volume control via an aluminium knurled flywheel "running on Formula One style ball bearings". The unit is turned on with a Ferrari-style 'Start Engine' button, and it sends music wirelessly to your hi-fi or home cinema system, up to 50m away. The receiver unit uses DWC-Aphex, described as "an audio processing system previously reserved for top recording studios and used by top recording artists and engineers for Linda Ronstadt, James Taylor and Paul McCartney in mastering their albums. "When the DWC-Aphex switch is enabled, your music immediately ascends into a powerful and spacious audio experience with a more 'live' sound, enhanced stereo imaging, deeper and more powerful bass and clarity. In addition, your audio system will come alive and sound more powerful and dynamic." The basic system comprises the Transmission Dock and Receiver, and additional Receiver units can be added to stream music to extra rooms.